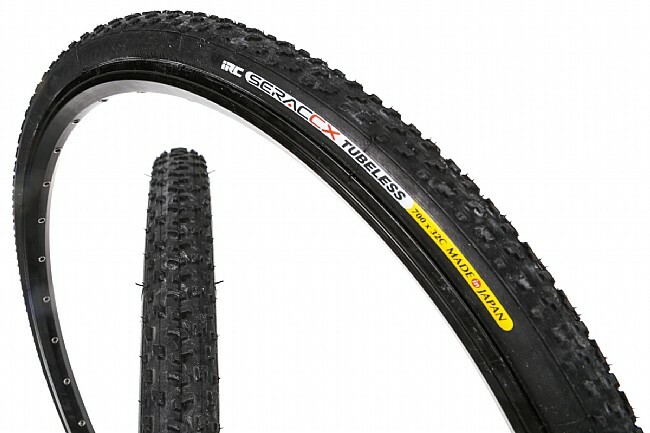 IRC's Serac CX Tubeless Cyclocross Tire uses their supple tubeless casing and grippy rubber compound for a competitive race option without the hassle of running tubulars. The medium-profile tread lets it perform in all conditions, with sharp shoulder knobs for cornering bite and alternating center blocks for ample braking traction while still rolling well. I bought this tire for my wife's setup this season, and she is loving it! It set up super easy with a floor pump on first installation, and holds air great. Low pressure are totally attainable as well, so this will hang with other top tubeless tires and even get down close to tubular pressures. Tread is great for almost all conditions except for maybe insane mud. One of the big things to note here is I did some research and this is one of the only tubeless tires that will definitely pass UCI width restrictions, even on quite a wide rim. So, if you're looking for a choice B (or even A) bike setup with tubeless and you're a speed demon UCI cx'er, this is a great option!